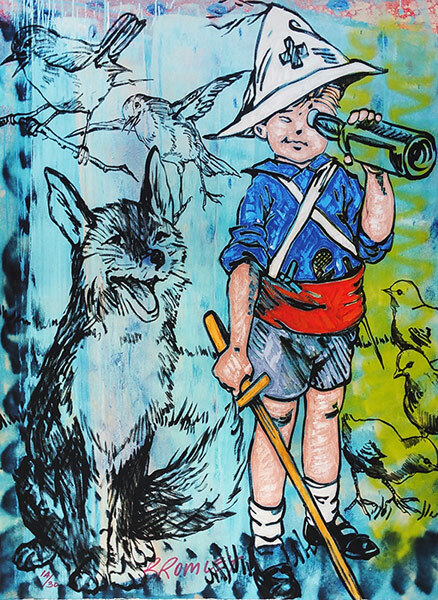 David Bromley Young adventurer, a limited edition of 30 only fine art archival prints, image size 75x55cm on torn edge rag mat paper made with archival ink, numbered and hand signed Bromley. Each work has the image to the edge of the sheet. David Bromley art prints titled Adventures at Sea, Belinda with flowers, Birds with flowers, Blue butterflies, Four young pirates, Gold butterflies, Red butterflies, Simon with red flowers, Young adventurer, Young artist horizontal, Young artist vertical, Simone in blue with flowers all prints available from Etching House.